$39.69 This item is selling for $39.69 on eBay. 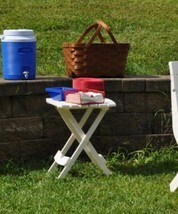 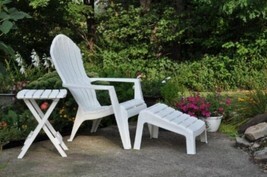 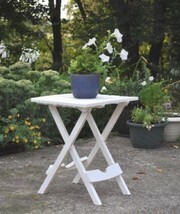 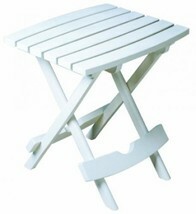 Your ID Here Why Choose Us Adams Manufacturing 8500-48-3700 Quik-Fold Side Table, White Ideal size to complement patio chairs, adirondacks, or chaise lounges Rated to hold up to 25-pound Durable resin material will not peel, rust, or rot Folds quickly and compactly for storage Uv-inhibitor allows colors to stay bright and attractive in the sun The Quick-Fold Side Table provides a perfect accent table for the patio or pool, holding laptops, books, sunglasses, and more. Folds flat for out-of-the-way storage, making it the perfect accessory for camping or fishing trips. Use it in tight spaces, like dorm rooms where space is at a premium. 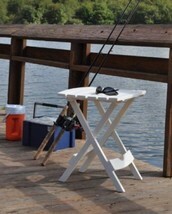 Weighing in at only 3-pound , it easily supports up to 25-pound Proudly made in the USA.